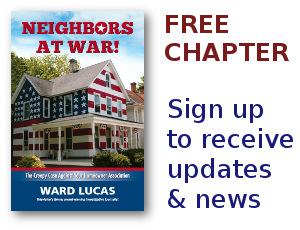 HOA Archives - Neighbors at War! 4 Comments on One Good Lawyer!!!!!!!!!!!!!! Don’t beat me up! I know there are other good, honest HOA lawyers out there someplace. Well, at least one or two. But I haven’t met them yet. But this lawyer actually ‘gets it!’ He understands about the kind of fascism found in many of America’s Homeowners Associations. He understands that HOAs are often a rat trap that ruin targeted homeowners at will. He gets the fact that once a bully board is in control of the HOA they can unleash unbelievable racism, discrimination and abuse. He understands that HOA lawyers are a corrupt layer of infection that can quickly contaminate the atmosphere of a neighborhood. He understands that HOA lawyers have little or nothing to do with ‘justice,’ it’s all about how much money can be pocketed from homeowners who find themselves in a hopeless situation.